Until recently, the Lincoln Inn in Essex was not a place that got foodies talking. Although I grew up in the town, I hardly ever visited. In later years, the spot conveniently located at the busy Five Corners intersection was where I went for a business lunch or to drink Scotch with old friends home for the holidays and unwilling to drive elsewhere. Was it my choice? Never. But that has changed now that The Belted Cow has taken up residence at the inn. Owned by a former IKEA human resources manager and an award-winning chef, the elegant 85-seat restaurant offers classy, interesting fare and good service. After two visits made in its first weeks, I look forward to a third. The ambiance gets things off to a good start. Mustard and rust walls, juxtaposed with wooden furnishings and snow-white linens, bring to mind the French countryside without seeming either pretentious or rustic. 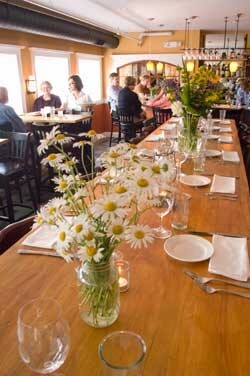 Servers are genial but focused, and each table is offered a choice of sparkling or still water. With few soft surfaces, the rooms can get a bit loud — especially when you’re seated near a large party — but the jazz piped over the speakers is a pleasant distraction. The currently succinct menu comes printed on heavy, creamy paper. In a town with little fine dining, the Burlington prices may deter some from stopping in: Most entrées are in the low twenties, and they max out, for now, at $26. But the fact is, the food is good enough to warrant a splurge. On Tuesday, an appetizer with a unique presentation got my meal off to a good start. A local lettuce mix from Pete’s Greens in Craftsbury was sprinkled with thin shavings of fennel and rolled tightly inside a slice of prosciutto ($9). Two such bundles were angled on a white plate dotted with scallion vinaigrette. Unlike a tossed salad, where every forkful is different, this presentation ensured a perfectly balanced bite every time: a bit of the saline-cured pork, some shreds of fragrant fennel and fresh, flavorful greens. I swapped one of my salad “packages” for half of the scallop appetizer ($11). Perfectly seared and set atop a sweet, silky parsnip puree, it was a lovely combination of sea and earth. And, as befits fruits de mer, the chef had imbued the tender, translucent flesh with briny bite by sprinkling it with just the right amount of salt. Given the absence of salt or pepper shakers on the table — although a server swiftly brought a pair to our neighbors who requested them — it was a treat to find that every dish was seasoned enough to bring out other flavors without actually tasting salty. Our final appetizer selection, grilled Red Hen bread topped with tender pieces of smoked pork, pink pickled onions and a blanket of cheddar sauce ($9), was also toothsome and filling. Two of the four main courses I tried lived up to the appetizers’ promise. The exceptions were two poultry dishes. The roasted half-chicken ($21) was a touch dry, but the delicious jus at the bottom of the bowl made up for it. It came with bright green broccoli rabe — a more flavorful relative of broccoli with smaller heads and plentiful leaves. I was slightly more disappointed in a duck offering ($23) that featured slices of breast meat atop confit, Pinot Noir cherries and cubes of roasted parsnip. The starchy root, which had been so lush in the scallop app, was a tad too crunchy here. And while the duck breast was cooked to a perfect rosy blush, the layer of skin and fat on the outside wasn’t crisp when it arrived. Finally, the meat, which was served sans sauce, needed some acidity to balance the fatty, salty and sweet flavors. Perfect it wasn’t, but it was enjoyable nonetheless. In fact, despite that list of (possibly picayune) objections, it still proved better than numerous dishes I’ve paid as much for at Queen City restaurants. The main courses I preferred: The grilled Boyden Farms ribeye ($26), which came with horseradish mashed potatoes and a petite salad, was cooked to a perfect medium-rare. The plate was classic, simple and well done. But my favorite was the halibut with a richly flavored pea-shoot broth and ramp butter ($23). A generous portion of pearly, flaky fish sat atop a bed of roasted fingerling potatoes and was strewn with fresh shelled peas. I enjoyed the local peas so much that, on my next visit, I ordered some on the side ($5). The bright green balls, slicked with butter and kissed with mint, were so good I couldn’t stop eating them. There were only a few desserts to choose from, but the two I tried were lovely. The crème brûlée was speckled with vanilla beans and just sweet enough. The rhubarb-strawberry croustade was even better. With flaky pastry dough, a perfectly blended fruit mixture and a scoop of Island Ice Cream, it was delicious enough to eat on both occasions. Even though The Belted Cow is newly opened, I observed only a few tiny service glitches, and it was clear the staffers had been carefully chosen and well trained. The first evening, our server forgot to replenish our silverware stash after clearing appetizer plates. When we asked for a new knife and a spoon, she delivered them promptly, apologizing for not having done it sooner. The second evening, our warm, engaging server enthused that everything in a particular pasta dish — bell-shaped campanelle with veal, pancetta and tomato ragu ($13) — was homemade. “The chef makes the pasta by hand?” I queried. “Oh, no, it’s Barilla,” he answered. I got an order of it to go anyway, and enjoyed the mellow sauce and perfectly cooked pasta. The only thing that might delay my return visit is the small and (for now) static menu. With only five entrées listed — and no specials offered the nights I was there — I’ve already sampled the dishes I found most enticing. My guess is that the chef, with many years of restaurant experience, is in the process of feeling out the market. If that’s true, I expect one of three things to happen in the near future: He’ll expand the menu, he’ll adjust the menu regularly, or he’ll leave the menu small and offer nightly specials. If any of those proves to be the case, I’ll be sure to stop in for more servings of The Belted Cow’s cuisine very soon.